an “inches” guide for your new patterns? to me, that you might also. Seamingly Accurate? has been an editor’s pick for “Best Half Square Triangle” method in a few different magazines. And the guide was even offered as a sweepstakes prize for Vogue Pattern Magazine. Click the magazines to read more about the article. 1. Peel off the backing of Seamingly Accurate? to expose the repositionable adhesive. plate, lining up the black “needle line” of Seamingly Accurate? with your needle as shown. Use any straight lines on your machine such as the edge of the throat plate to help you line up your Seamingly Accurate? straight on your machine. Use a ruler to help you. Remember that you can remove and reposition it many times if needed. If you have an accessory case that opens or a removable table, or free-arm bed, make a cut in the Seamingly Accurate? so you can open your accessory case or remove your arm or table without removing Seamingly Accurate?. You can position Seamingly Accurate? any way you like. 3. Using a craft knife, cut around your metal throat plate and bob-bin case. Remove this piece of paper, or you can mark where you want to cut with a pencil, remove Seamingly Accurate? from your machine, cut with scissors, and reposition Seamingly Accurate? on the machine. If you have an accessory case that opens or a removable table, or free-arm bed, make a cut in the Seamingly Accurate? so you can open your accessory case or remove your arm or table without removing Seamingly Accurate?. 4. 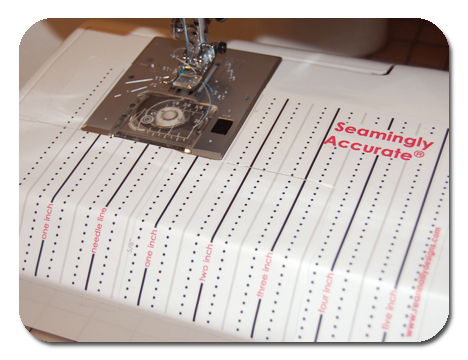 Now your guide is fitted to your sewing machine and can be easily used on many occasions. Your throat plate position will vary depending on your sewing machine brand. to that pesky bobbin case during your sewing afternoon. Seamingly Accurate? is also a protected registered trademark.